The Anaheim Jr. Ducks have announced that 16U AAA defenseman Chad Sasaki has committed to play his NCAA Division I hockey at Colorado College. Sasaki, 17, is in his second season with the Jr. Ducks’ 16U team, which won the California Amateur Hockey Association state championship earlier this month. 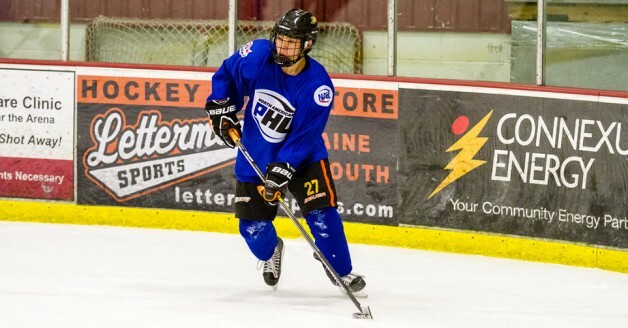 The native of Cypress also had a tremendous season in the North American Prospects Hockey League (NAPHL), leading all 16U defensemen in scoring with 21 points in 20 games. The Jr. Ducks won the NAPHL regular-season title with a 19-1 record. Sasaki also played in the NAPHL 16U All-Star Game for Team Blue back in December, and was selected as the NAPHL 16U Defensive Peak Performer for his performances during the months of September and January. It’s another step in right direction for the Jr. Ducks, as well as the Anaheim Ducks High School Hockey League (ADHSHL), as Sasaki is the second player ever to commit to a NCAA Division I program directly from the organization – and the first from the ADHSHL. “The NAPHL has been a great platform for our players to receive the necessary exposure from (the North American Hockey League, United States Hockey League) and NCAA Division I and III programs,” said Jr. Ducks 16U AAA head coach Alex Kim. Sasaki holds a 4.6 GPA at Servite High School – one of the premier academic institutions in Southern California and also a member of the ADHSHL. “Coaching Chad the past two seasons has truly been a privilege,” added Kim, who played two years at CC from 2000-02. “He has a superb attitude, is humble and is well received by his peers. “His willingness to learn and dedication to working his hardest on a daily basis have truly been instrumental to his development as a player and as a person. His parents have done a fantastic job in raising him and I’m happy for them. Sasaki is the 11th current player from the NAPHL this season to make an NCAA Division I commitment and second from the Jr. Ducks, joining teammate Jack Gates, who committed to Colorado College in December.